Rockstar Energy Racing made the trek up to Seattle and back in the open air stadiums of the West. For the second consecutive week less than desirable weather was experienced. Last weekend snow, this weekend rain. For the first time this year the Saturday schedule was abbreviated with the track being covered for as long as possible. The rain actually held off for most the day. Sprinkles didn't really start until the track was uncovered. It rained off and on for much of the night show, but the track never became unridable. It was muddy but not terrible. Sometimes however that condition can be very deceiving. Most riders would rather it rain hard or not at all. Davi Millsaps looked incredible in the final 450 qualifying practice of the day. Not only was he on top of the leader board for the majority of the practice, but he just kept posting faster and faster times. It was no surprise that he easily won his heat race by several seconds. Then as the track crew was reworking the racing surface prior to the 450 main, the clouds began to spit yet again. Davi decided to have mechanic Steve Westfall change his front tire. The expectant downpour did not arrive however so the tire change was not needed. Millsaps had a decent start and quickly moved into 3rd. At one point he was catching the leaders in front of him and really seemed to be pushing to the front. Then all 3 riders settled into their pace on the tough track and cruised to the finish line. Ryan Sipes hasn't been able to line up on the gate and race since the middle of January. After breaking his hand in a pile-up at Anaheim 2, then having to have a couple surgeries to repair it, he has been kept off the bike for quite some time. Ryan was ready to make his return, but the unpredictable track made things very difficult. He looked to be riding good enough to pick up a podium however at about the halfway point of the main event. That is about the time his arms began to pump up. Anyone who has ever had arm pump knows it's scary. Imagining arm pump on a slick, rutty Supercross track is a frightening thought for most. It was clear that Sipes was not just going to give up though. He fought for every position and battled with his peers til the bitter end. His speed was there and he needs to take the positives into next week. Jason Anderson was very fast all day. Frequently on the qualifying leader board. In his heat race he got a great start, then it was red flagged. After the caution it was a full restart and again Jason rounded the first turn in a stellar position. He rode to a solid 2nd place in the heat but more impressively was the fact that he was catching Eli Tomac and remaining mistake free on a track most riders were faltering on. Things were looking very good going into the main. Unfortunately Anderson's main event did not start as well. He began the race buried in the pack. Then things just got worse. With the track being so rutty, a lot of the riders were looking for new lines on the very edges of the track. Under these circumstances, tuff blocks get kicked into the track frequently. That is exactly what happened just in front of Jason. He could not avoid the tuff block and went down. He is certainly not a 10th place guy, but with everything that took place, he couldn't ask for much more. Anderson nearly won in Salt Lake City last year, so he will be looking forward to next week. The team trio heads to Utah next week where it has snowed the past several years. Also an open stadium, the hopes will be for a nicer climate than the previous two races. Davi will aim for his 11th podium and 3rd win of the season. 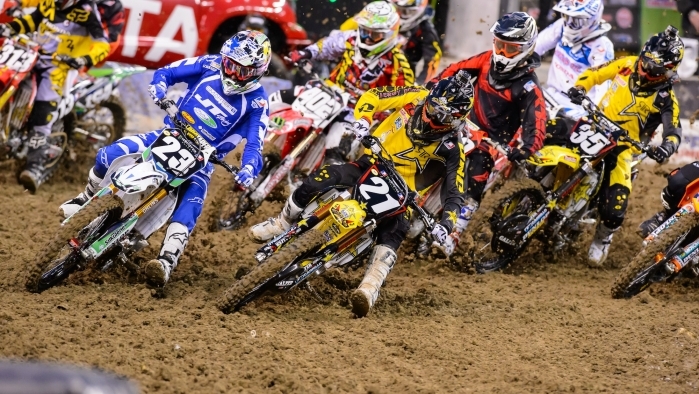 Sipes will look to get back on track returning from his injury and Anderson will compete his first career Supercross win.